We can design a dream deck for you, or build it from a design of your own. Our knowledgeable and experienced staff, are experts in the construction field. Your Porch and deck Building in Leitchfield will be built with only, quality materials from the local area. We never put a single nail in your Porch and deck Building in Leitchfield construction project. 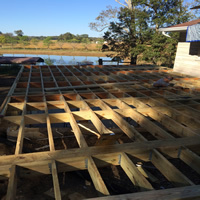 Deck building being one of our favorite projects, you can rest assured that your structure will stand the test of time. We pride ourselves on the quality and customer care we provide before during and after construction. We also provide up to a 5 year warranty on all labor related issues.